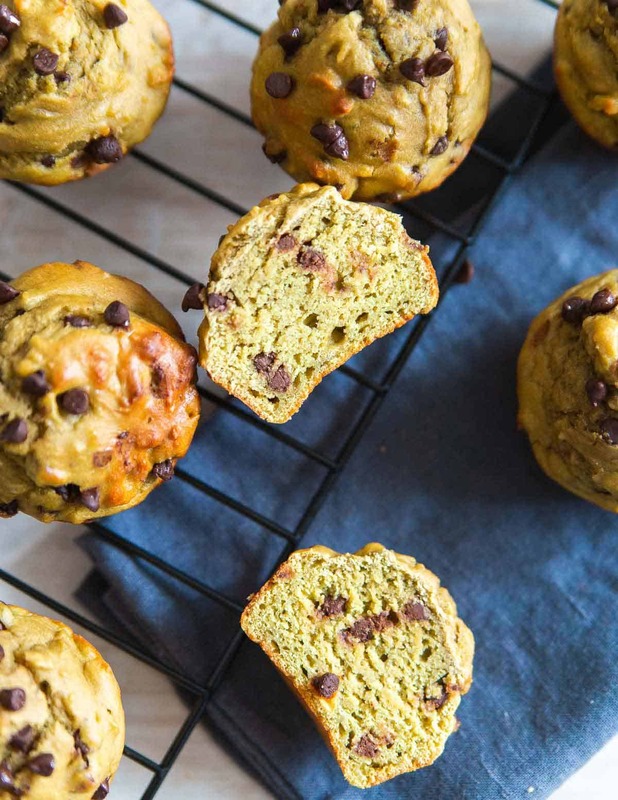 These avocado muffins are packed with healthy fats, made with whole wheat flour and studded with chocolate chips for a fun and satisfying snack. No, I didn’t accidentally forget to post these avocado muffins before St. Patrick’s Day but they do have a fun green tinge to them and would be perfect for the holiday. Avocado has had a pretty good few years. From avocado smoothie bowls to avocado pancakes, avocado tarts and avocado ice cream, you might say it’s “on trend”. Ha. I’ve moved on from avocado toast lately (hummus toast being my new favorite) but I do still love baking with avocados. Using the flesh of a ripe avocado in breads and muffins is such a great way to replace the fat in a recipe. It can be used as a substitution for butter and oil pretty easily and it adds a really nice smooth texture and moisture to the final result. In fact, the texture of these avocado muffins might just be my favorite part. 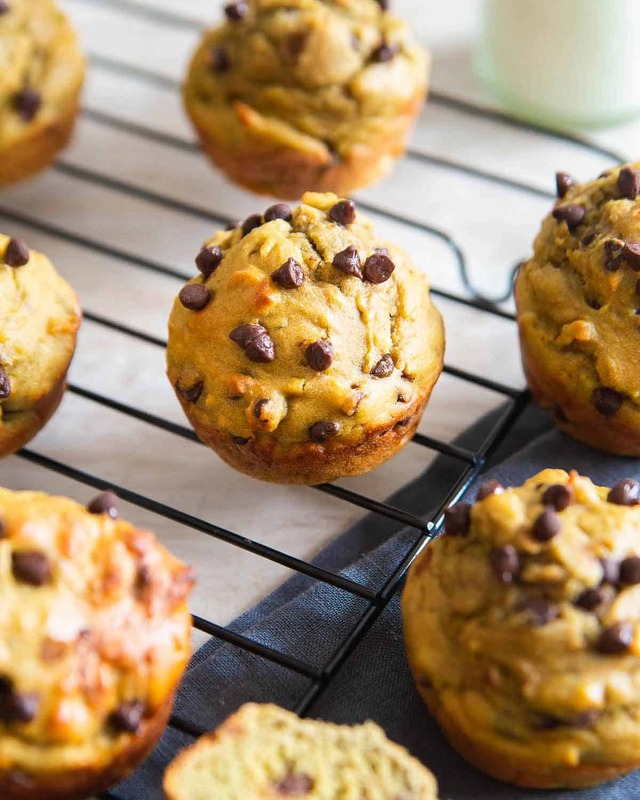 Not that any muffin recipe is usually difficult, but the simplicity of these avocado muffins is another great thing about these tasty little snacks. Blend together wet ingredients in the blender until smooth. Mix the wet and dry ingredients together until combined. The blender does all the grunt work for you and you’re basically just mixing and scooping into the muffin tin. Feel free to sub out the chocolate chips for any other add-in you like: dried fruit, nuts, seeds or a combination of all of them. Just keep the add-ins to about a half a cup and you won’t have any issues. This is an incredibly forgiving recipe, the first time I made the muffins, I actually forgot the eggs until right before I was about to scoop the batter into the muffin tin. I beat the eggs, added it to the batter, did a pretty poor job of mixing and they still came out beautifully with a nice high rise to each one. What Do Avocado Muffins Taste Like? You actually don’t taste the avocado in the muffin. So in case that was a concern for you, don’t fret! Because the muffins are sweetened with banana and a little bit of honey, the taste is similar to a whole wheat banana bread, just a bit more moist and with a creamier texture thanks to the avocado. I love the mini chocolate chips in here and that pop of chocolaty flavor. 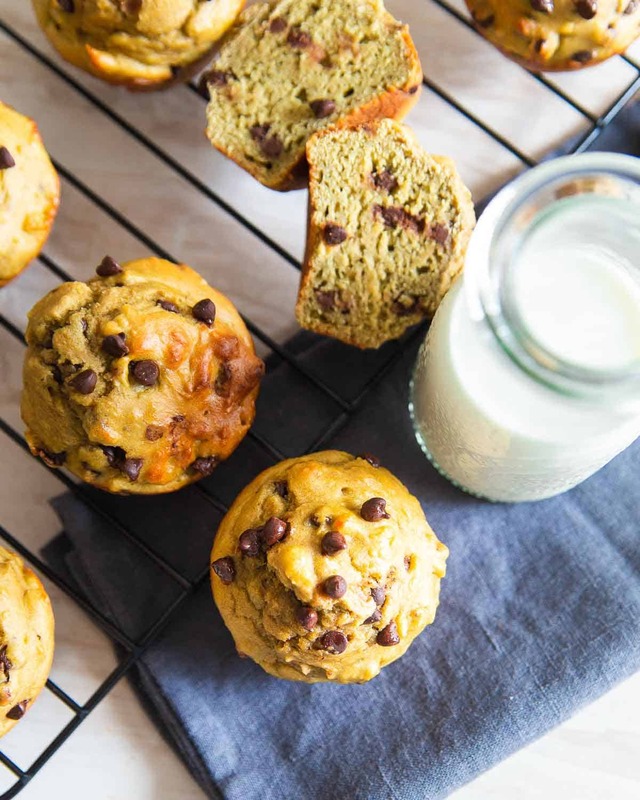 Reminds me of this pumpkin banana chocolate chip bread a bit both in flavor and texture as pumpkin works similarly to avocado in baked goods. If you wanted to try and make this recipe vegan, I would substitute maple syrup or agave for the honey and try flax or chia eggs in place of the eggs. I haven’t tried it this way but I have a feeling it would work pretty well considering how adaptable this recipe is. For gluten-free, I’m pretty confident a gluten-free baking flour mix would be a successful substitution for the whole wheat pastry flour in this recipe. I always use this gluten-free flour with great results. 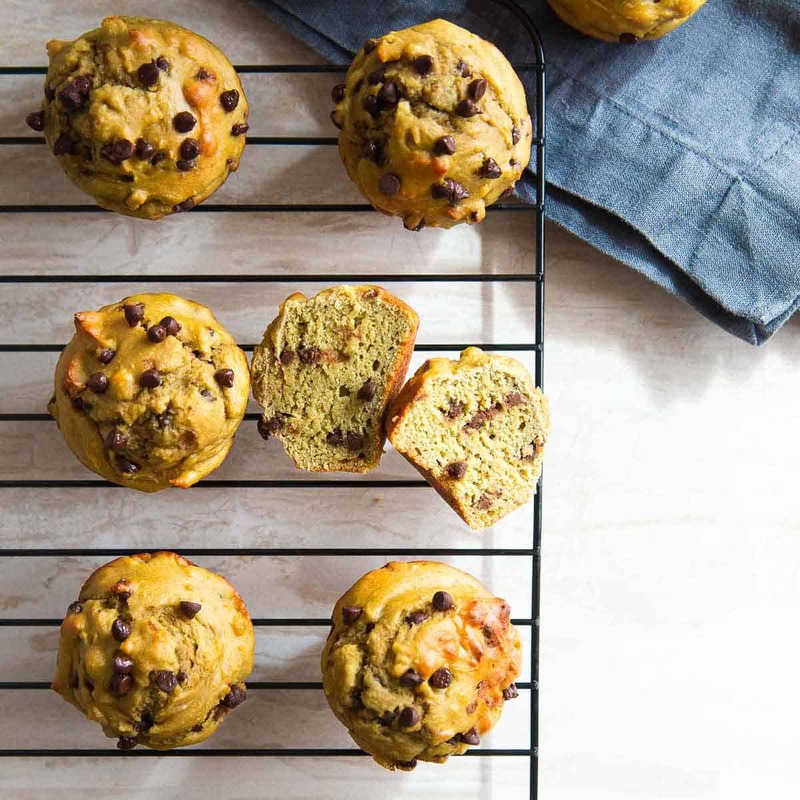 Of course, if you want tested gluten-free muffin recipes, try these banana chia muffins, strawberry corn muffins or these chocolate coffee peanut butter muffins – all great options! How Do I Store Avocado Muffins? The muffins will keep in an airtight container for about a week in the refrigerator. If you’re planning to eat them all in the first couple of days, they can stay on the counter. Otherwise, throw them in the refrigerator. They make an excellent option for weekly meal-prep. Don’t forget about snacks when meal-prepping! I love having a batch of some baked good for the week and these avocado banana muffins have been just that the past few weeks. I tend to go through phases with baked goods for meal-prep. 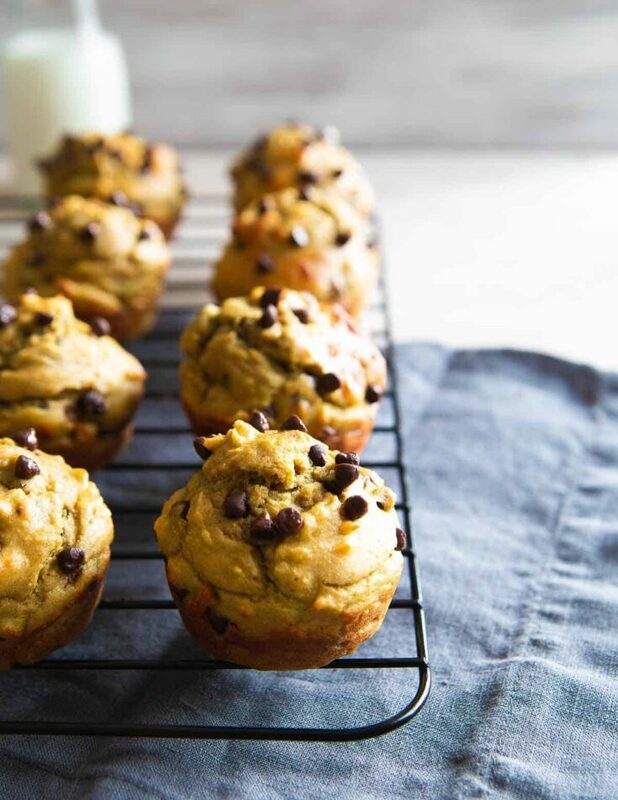 Sweet potato oat bars were the latest obsession but have been put on the back burner for these muffins lately. After picking up a huge bag of frozen wild blueberries lately, I have my eyes on these whole wheat wild blueberry ginger muffins next! I hope you give these avocado muffins a try! Combine flour, baking powder, baking soda and salt in a large bowl and whisk together. Place avocado, eggs, milk, banana, vanilla and honey in a blender. Blend until completely smooth. Add the wet ingredients to the bowl with the dry ingredients and stir until just combined. Add chocolate chips (or other add-in) and gently fold into the batter. Scoop batter evenly into muffin cups (makes 10-12 depending on how full you fill each cup) and top with additional chocolate chips if desired. Bake for 16-20 minutes until edges of muffins start to turn golden brown and centers are baked through. Remove from the oven, let cool for a few minutes then remove each muffin and place on a cooling rack. *use 1/2 cup of any add-in you like: chocolate chips, dried fruit, nuts, seeds, etc. I can’t wait to try this muffin recipe. They would be perfect for recipes on the go! These were amazing, considering they are on the healthier side. I can’t get enough of them! Thanks for the recipe! Never thought of adding avocados. Def going to try! Avocados are easily one of my favorite foods of all time. 😊 I use them in a lot of recipes but I have never baked with them!! I am always looking for a new and different recipe and You Avocado Muffins sure do fit the bill. I have never heard of them before and can’t wait to try them.